A 17-year-old school student was shot dead by two unidentified motorcycle-borne assailants in the Malviya Nagar area of South Delhi, the police said on Thursday. Frustrated with militant violence in the Kashmir valley, they came here to earn their livelihood and were gradually settling down in the national Capital. However, their happiness was short-lived. Many city hospitals that had discharged patients without proper treatment have readmitted them after pressure from various media groups and social organizations. Jessaram Hospital yesterday readmitted three patients —Mira (25), Usha (28) and Kamlesh (27), who were reportedly discharged after first-aid on the night of the blast. The Noida Authority Board in its 154th Meeting today decided that the draw for 2004 Residential Scheme will now be held on October 17. This was stated by Noida CEO Mohinder Singh while briefing the media about important decisions taken by the board. Saturday’s serial blasts that sent harrowing waves among the Capital dwellers have not spared the Delhi police and the search squads from their usual share of constant vigilance. Spurious calls have kept the police and the search teams on their toes since the blast evening. They have been running around searching every nook and corner of the suspicious place to prevent any untoward incident. Muslim intelligentsia attached to the Congress has decided to meet the party high command and demand 10 tickets for Muslims in Delhi assembly elections. In a move that will go far in getting students a much-needed platform for an interface between the industry and the varsity, Delhi University launched its Central Placement Cell today. The Municipal Corporation of Delhi’s (MCD) Standing Committee members today discussed the safety and security of Town Hall that houses the MCD headquarters. Rising incidents of security threats have created huge demand for qualified security personnel in all industrial locations, especially in the National Capital Region (NCR). WWE wrestler Batista at a press conference in New Delhi on Thursday. A biker was run over by a recklessly driven ‘killer’ Blueline bus in the Capital, taking the number killed by the killer fleet to 70 this year, police said today. Sena Bhawan, headquarters of the Indian Army in Central Delhi witnessed a minor fire today afternoon. Nobody has been reported injured in the incident. Enraged over her growing intimacy with a boy, family members of a teenaged girl mercilessly beat up the couple and then burnt them alive in a field in this satellite township today. There is no way to check the dengue menace in Ghaziabad, it appears. Two women in Modi Nagar, reportedly suffering with dengue succumbed to the scourge. A woman who got married less than six weeks ago was stabbed over 20 times today by two youths when she was alone at her home here. A city court today rejected the anticipatory bail plea of Utsav Bhasin, 19, who allegedly rammed into a motorcycle last week while driving his BMW car, killing one and injuring another. Four policemen were suspended on Wednesday for cremating an accident victim’s body in this Delhi suburb, without waiting for the mandatory 24 hours to allow the relatives to claim it, an official said. A class IX student thrust a pen into his classmate’s eye during a scuffle, causing severe damage that required the teenager to undergo surgery, the victim’s relative said here on Tuesday. The GB Nagar police claimed to have solved the murder of Kavita. According to police, Kavita’s husband had killed her last Wednesday with the help of his cousin, suspecting her of illicit relations. The Indian Culinary Forum (ICF) and PHD chamber and the Indian Federation of Culinary Association (IFCA) will jointly host Chef Awards 2008 on October 18 that is the International Chefs’ Day. The award function will be held at Hotel Ashoka in the city. With help pouring from across the world for 2.8 million people affected by Bihar floods, a group of eunuchs in the Capital has donated Rs 31,000 for carrying out relief work in the marooned districts. The incident took place at around 3 pm near Lado Sarai. “Neha Gupta, a student of class XI at a girl’s government school in Mehrauli, was returning home in Aaya Nagar from school. “While she was waiting for the bus at the stand, two bike-borne assailants came and the pillion rider shot her twice before fleeing from the spot,” a police official said. “She suffered gunshot injury on right arm near shoulder. She was taken to AIIMS where she was declared brought dead by the doctors,” the police officer added. The girl’s father Ashok Gupta runs a tailoring shop at Gurgaon. Saturday’s serial bomb blasts have claimed the life of Abdul Kasim Mohammed while his elder brother is battling the serious injuries he suffered in the blast at the Ram Manohar Lohia Hospital. “Both of them came to Delhi in a bid to escape the troubled times in Kashmir, little did they know about this city,” said Shafique, a cousin of the two brothers. They shifted to Delhi about a decade ago from the highly disturbed Kulgaon tehsil in Anantnag district. Both of them were cycle rickshaw pullers, carrying articles like refrigerator, television and furniture from one place to another. “Kasim got married only 14 months back and has a four-month-old boy. His family was happy that at least he was far away from the violence in Kashmir,” said Shafique. The brothers worked hard and sent most of the earned money home. “They were themselves living in a small room in Karol Bagh,” he said. It took more than three days for victim’s parents to arrange the money required for coming here to join Farooque. “Thankfully I was in Delhi. His family could only manage to come today,” said Shafique. While Farooque himself tried hard to recover, the family told him that Kasim was alive and admitted to a hospital in Srinagar. “We will only tell him about Kasim’s death after he recovers,” he said. Even as the family suffered serious human loss in Delhi, they thanked the residents for helping them in the hour of need. “The hospital provided free medicines for Farooque’s treatment. Everybody has been very helpful. We want to thank them all, but we would now want to go back to Kashmir, the situation in Delhi is worse,” said Shafique. Kamlesh from Gali number 42 in Karol Bagh underwent a leg operation on Saturday night in Jessaram Hospital and was discharged the next day. But, Lakshmi, her sister-in-law said that Kamlesh kept complaining of pain in the operated leg as a splinter remained in the leg even after the surgery. The hospital readmitted her; she is now undergoing treatment. The other two persons admitted back to the hospitals—Mira and Usha–had been complaining of nausea and dizziness since the night of the blast when they were discharged after initial medication. Earlier, Ram Manohar Lohia Hospital had readmitted Nisha a day after the blast as she had complained of splinters in the upper part of her back. Nisha, who was injured in the Connaught Place blast, was earlier sent home on Saturday itself, after being administered initial treatment by the doctor on casualty duty. Now, though Nisha is out of danger, she can’t help remembering her friend Babita, who was brought dead to the hospital. Noida Authority will be informing the applicants for the scheme through a public notice as well as individually. Since the applications for this scheme were received by various banks, a large number of applicants had not mentioned their IT pan numbers and complete addresses. In certain cases, more than one member of the same family had applied. The CEO said the three-member committee, appointed by the High Court, has laid down the procedure to be followed for conducting the draw. The total number of 1,250 plots has been completed now after some adjustments. Half of the plots—625 are reserved for the applicants from ST, SC category while the other 625 are for the general category of applicants. Noida chief executive said the draw this time would be conducted in absolutely fair and transparent manner under the supervision of the committee members and in presence of members from the public and the media. 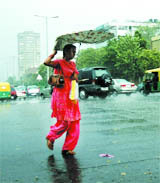 The department heads of Noida Authority are examining the applications and will issue the needed certificates. A large number of applications were not in order, for instance 117 minors had also applied while 228 multiple applications had been received. Other important decisions taken by the Board today pertained to D.S. Road, sports city and Abadi land. Now Noida Administrative offices will be constructed in Sector-44 on Expressway near Maha Maya College instead of city centre in Sector-32 which will now be developed as a grand commercial market, the chief executive officer said. Today the Kalka Mail-2112 was detained at Ghaziabad station for almost one hour as the North Central Railway at Tundla was informed that there were explosives in the Kalka train. After receiving the call, the officials called up the Northern Railway office. Thereafter, the message was sent to the Ghaziabad station, wherein several police and bomb searching squads rushed and carried out a thorough search. After the search, they found out that it was made just to scare the people. The chief public relation officer of Northern Railway, Rajeev Saxena, said, “We were told by the Central Railway Control Room that there was explosive material planted in the Kalka Mail after the train had already departed Old Delhi Railway Station at 7:55 a.m. and so we called up the Ghaziabad station to detain the train there.” “Their search teams checked the train and it took almost one hour to ascertain that it was a hoax call,” added the CPRO. Meanwhile, the Delhi police has been receiving hoax calls since the blast evening informed the ACP, Ranjan Bhagat, PRO of Delhi police. They said that so far the Congress has been giving tickets to six candidates which is not fair. The community is in majority in 15 assembly constituencies. But they are demanding only 10 seats, sources said. The sources added that they are demanding tickets from Kirari, Chandni Chowk, Matia Mahal, Ballimaran, Vikaspuri, Jangpura, Sangam Vihar, Okhla, Seelampur, Babarpur, Mustafabad, Karawal Nagar, Gandhi Nagar, Sadar Bazar and Ghonda. They said that if the Congress has given tickets to Muslim candidates from these seats, the BSP will not be able to defeat the party. The vote banks of Bahujan Samaj Party and the Congress are Muslims and backwards. In these constituencies, Muslims are in majority. According to a survey report conducted by a private agency, Chandni Chowk consists of 20 per cent Muslim voters, Matia Mahal 48 per cent, Ballimaran 38 per cent, Seemapuri 24 per cent, Seelampur 61 per cent, Ghonda 18 per cent, Babarpur 45 per cent, Mustafabad 36 per cent, Karawal Nagar 19 per cent, Jangpura seven per cent, Okhla 43 per cent, Kirari 35 per cent, Vikaspuri 20 per cent and Sangam Vihar 20 per cent. The vice-chancellor, DU, Deepak Pental, announced the launch of the cell in the presence of representatives of Assocham, CII, FICCI, dignitaries from industries like CEOs, presidents, MD’s, chairmen of various companies. The Central Placement Cell aims at creating an interface between industry and academia and helps provide a unique platform to students. The industry will get a wider choice to select students from different disciplines with variedbackgrounds and competencies. The CPC will start registering students as well as industries immediately after the launch. Students interested in placements will have to fill in the prescribed student registration form obtainable from their respective colleges or they can download from the DU website. The interested corporate houses may contact the CPC and register themselves through the prescribed performa. The response sheet and soft copy of brochure for industries will also be availableon the university website www.du.ac.in and http://placement.du.ac.in. In the current year, placement facilities would be available only for under-graduate students. However, soon these would be extended to cover postgraduate students as well. The placement team has been constituted under the overall supervision of S.K.Vij, dean, Students Welfare. The meeting was held in view of the recent terror blasts that rocked the city. The members said that hundreds of employees, Mayor and other local senior politicians work at the Town Hall everyday for over six to eight hours. Besides, important records of Delhi including heritage records are kept in the office. But there is no security arrangement. Any anti-social element can enter the Town Hall without any restriction. A single explosion can damage the records, they said while expressing concern. Standing Committee chairman Vijender Gupta said that security arrangement needed to be checked at the building. A metal detector should also be installed at entrance and vehicles entering the parking lot should be checked thoroughly. Municipal commissioner A.K. Nigam said that within 15 days security guards would be deployed at the entry points of the Town Hall and metal detector would be installed at entrance of the parking lot. About two lakh security forces would be needed in next two years in NCR’s approximately 38,000 industrial units, according to Assocham. In its assessment of industrial security in the NCR - the after-effects of the serial bomb blasts in the Capital, the Assocham has pointed out that in addition to the projected demand for trained security staff, approximately 15,000 to 18,000 qualified security personnel would be required to provide security during the Commonwealth Games of 2010. Releasing the Assocham assessment, its secretary general, D.S. Rawat said that it would be unrealistic to expect the police and the para-military forces to take care of industrial security, especially in the corporate sector. Therefore, the estimated 10,000 private security agencies operating throughout the country would have to take on the challenge to provide for safety of human lives in all industrial locations. Rawat said that the Chamber is yet to estimate the total requirement for trained and qualified security personnel for industrial units located in different parts of the country. But in case of NCR, the requirement is conservatively estimated at around 2 lakh in its approximately 38,000 industrial locations, assuming that each industrial unit at least needs 5 security personnel. According to information available with the Assocham, 150-200 security agencies, most of which are directly associated with the Chamber, currently provide industrial security in NCR. These personnel include nearly 1.5 lakh guards and supervisors level people. With a spurt in infrastructure, shopping malls, business houses, industrial installations and individual and private establishments in metros and other urban and sub-urban places, there has been an increase in the need of security personnel and services to ensure safety at all times. “The Assocham assessment reveals that over past few days, the NCR witnessed terrorist attacks in which precious human lives have been lost. The police and para military forces have been doing their best to manage this menace. But it is not practically possible for them to provide security to all private units,” he said. Robert Mathew, 28, died instantly when the bus hit his bike in Gole Market close to Connaught Place around 10.30 p.m. on Wednesday. The bus driver and the conductor fled the scene. According to fire officials, five fire fighting vehicles were deployed to control the fire that broke out on the third floor of the building. “We got a call at around 12.30 pm and rushed five vehicles to control the fire. The fire was controlled within 20 minutes,” informed a fire official. According to information, short-circuit in the air conditioner on the third floor caused the fire. Sena Bhawan was evacuated during the fire fighting operation and work resumed only after the fire was controlled. The incident occurred in Vair locality of Greater Noida. According to the police, Rekha, 18, daughter of Gulab Singh Jatav was in love with Sonu, 19, son of Raju Khatik who lived nearby. At about 11.30 a.m., Rekha asked Sonu to join her in her father’s field where she had gone to collect fodder for the cattle. The girl’s family caught the two in an objectionable condition in the field. “Angry over her love affair, her family members thrashed the lovers till they were semi-conscious. Then they dragged them to a stock of maize plants and burnt them alive,” said senior superintendent of police R.K. Chaturvedi. The village guard informed a police constable about the incident. 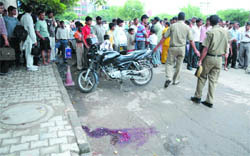 The police rushed to the spot and recovered the half-burnt bodies of Rekha and Sonu. The father of the boy has filed a police complaint accusing Rekha’s family of brutally killing the lovers. The police has registered a case against the girl’s family, who have fled from the village. Rakhi, 32, of Nand Nagar colony, had had gone to Sakheda village in Modi Nagar to meet her relatives. She developed high fever there after which she was admitted to Lok Priya Hospital with a platelet count of 44,000. After being diagnosed of dengue, she was rushed to a Ghaziabad hospital, where she breathed her last. Similarly, Seema, 18, of Govindpuri in Modi Nagar died at Meerut medical college. She was rushed to the hospital with high temperature, where her condition deteriorated. Reportedly, there are about 18 dengue patients under treatment in various hospitals in Ghaziabad, however, health authorities maintain they are not aware of it. The incident took place at about 11.15 a.m. when Nancy, 26, was alone at her home in Lakshmi Garden. She was married on August 8 to Sumeet Naveen, an IT expert. The attack on Nancy seems to be an act of professional criminals who left behind their gloves and dagger at the spot before fleeing on their motorcycle, a police official said. After the attack, Nancy came down from the first floor of her house to the ground floor. On hearing her screams, the tenants as well as the neighbours took her to Sethi Hospital. Ashok K. Sethi, the doctor attending to her, said that the assailants had stabbed Nancy at over 20 places. The police officials said that the tenants as well as the neighbours had seen two youths going to Nancy’s house in the morning. Ten minutes later, the youths were seen rushing back to their motorcycle and they sped away, the police officials said. The police suspect that the youths attacked Nancy from behind when she was working in the kitchen. “She was stabbed multiple times as if the youths had an old enmity with her. Though gold jewellery worn by her is missing but we cannot term it as a robbery,” the investigating official said. Additional sessions judge Brijesh Garg rejected Bhasin’s bail plea after hearing the Delhi police’s and the defence’s arguments. The Delhi police’s counsel informed the court that the police had recorded the statement of Mrigank Srivastav on September 15, who along with Anuj Singh was injured in the September 11 accident. The two were riding the motorcycle. Singh succumbed to his injuries on September 13. Srivastav, in his statement, has narrated how the accident took place and how Bhasin, son of an industrialist, fled from the spot soon after hitting them, the police counsel said. “To form the exact sequence of events and conduct a Test Identification Parade (TIP), we need the custody of the accused,” the counsel said. Harola police post in-charge Om Pal and Haridarshan police post in-charge Pawan Malik, along with two constables, on Tuesday evening cremated the body of Sumer Singh, 55, who died after a tractor hit his cycle near Sector-4. After the postmortem examination, the four policemen cremated the body without either identifying him or waiting for his relatives. On Wednesday morning, the family members of the victim learnt about it and protested outside the office of senior superintendent of police. The victim’s brother said that Sumer Singh was seriously injured in the accident that took place on Tuesday afternoon and he succumbed to his injuries at the Metro Hospital. The incident took place on Monday in S.D. Inter College, Ghaziabad. The victim, Rohit Singh, was taken to the All India Institute of Medical Sciences (AIIMS) at Delhi as the cornea of his left eye was perforated. Rohit’s uncle Manoj told reporters that when the class teacher had stepped out of the room, a scuffle took place during which a student, Perler, of class IX shoved a pen into Rohit’s left eye. Rohit was rushed to the AIIMS where doctors repaired the cornea through surgery. Her husband, a software engineer has been arrested. The police has also recovered the weapon of murder and the blood- soaked dress last worn by Kavita. This year a unique charity dinner will be organised. This year dinner’s theme is — ‘Green Cuisine’ offering organic, trendy and healthy dishes where chefs from different hotels and restaurants will present their culinary creations under one roof. Besides, a weeklong cooking demonstration by chefs from the top eateries in Delhi and NCR will also be organised. Eunuchs from Laxmi Nagar in East Delhi gave the amount as a donation to the traders’ organisation in the area for helping the flood-ravaged people in various districts of Bihar.